Birthday Post ~ I'm 23! I'm 23! Birthday's are fun because I get to eat a lot of vegan food and do something fun. Even though yesterday was my actual birthday I celebrated on Sunday instead and I figured I'd share my day with you all! I went with my family and Darrin to Phipps Conservatory in Pittsburgh to start the day. I've never been there before but it was so awesome! I want to go back again in a few months. Each room is so unique and full of amazing plants that I've never seen before. There was a room full of fruit trees that had me so excited. Bananas, star fruit, oranges, pineapples, lemons, papaya, etc. I was in heaven in that room. It took everything I had to not pick a fresh banana off the tree! I also forgot to take my camera with me but thankfully my phone quality is good enough to make due and take pictures like this. I loved this flower so much and I'm not even sure what it's called (ahh) but I took so many pictures of them. Nature amazes me! We went to Eden for brunch and I tried the mushroom butterbean burger for the first time. I got it with a side of veggie soup and a green smoothie. The burger was insane!! So good. I can't believe I haven't tried it before. I then proceeded to eat a quarter of my moms waffles too, whoops! We stopped at Whole Foods, the animal shelter, and Gluuteny for some cupcakes before heading home. My mom made non vegan cupcakes for everyone else and I got a cappuccino and almond cupcake. Darrin and I cut them in half and split them. They were both so good, but I'm a huge fan of the cappuccino one! It was delicious! My day was spent doing fun things with people that make me happy and I am very grateful for it all. I have learned to look at things that I have been given in my life and appreciate it all. Excited to see what this year will bring me and to look back on this day and remember how much there is to make me smile! I could have came up with a fun name for this juice but I want the whole world to know how special it is. This is literally my favorite juice recipe ever. And trust me, I've had a lot of juice. But this one is one that I can't get over. Whenever I made it I was running around the house forcing everyone to try it. I was so excited. I just wanted to share the juicy love and nutrients with them all like I wish I could do with you too. I've been so exhausted the past few days. I went to see Kaskade with my friend on Thursday night and ended up not getting home until 2:30 a.m. which is very unlike me! Then I had to be up at 7 a.m. for work. So I've been working on getting caught back up on my sleep. I'm not used to getting under 8 hours hardly ever so when it happens it takes a lot out of me. But honestly whenever you take care of yourself very consistently for a long period of time and then you end up not doing it you can really tell a difference in how you feel! I've been using this juice recipe to get back into the swing of things and get ready for a day of birthday celebrating (October 19, yesss) with my family tomorrow! Juice together all ingredients. Serve, enjoy! I'm into elaborate breakfast foods. Breakfast is the most important meal of the day so why not make it special?! I love waking up every day and making fancy banana ice creams or oatmeal. It's fun, it's delicious, and it's fueling me for my day ahead! Now that the leaves are changing and the sun is setting much earlier I am all about fall themed foods. I mean just look at this banana ice cream from the other day. So good! But it left me freezing for the longest time! So I've been incorporating more oatmeal into my life and oh yesss, so good. Maple walnut oatmeal is on the menu today. A sweet and comforting bowl of oatmeal is just what you need to start your day off right! Not much effort required to make or clean up this breakfast and it'll leave you feeling great for the exciting day ahead! In a small pan combine almond milk, oats, walnuts, cinnamon, and nutmeg; cooking at low-medium heat for 5-10 minutes depending on your preferred oatmeal consistency. 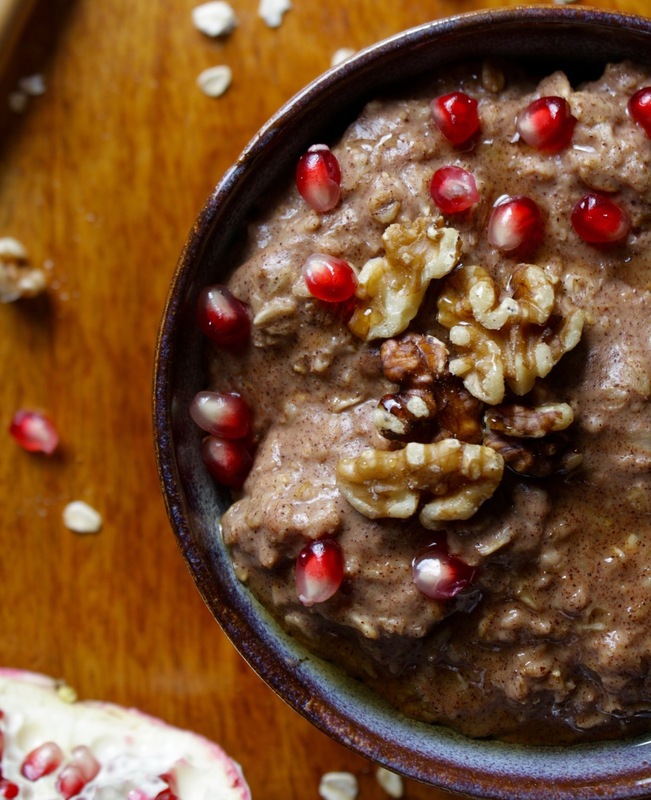 Remove from heat and pour into bowl topping with pomegranate seeds, walnuts, and maple syrup. Serve, enjoy! Halloween is awesome. I think we've talked about this before, but I'm a big fan. To get you all amped up for Halloween I figured I'd recreate my Spider Truffles. My first creation of these was so long ago! Lots has changed since then and I just figured I'd make two options for these little cuties. Since I became vegan I've realized that all living things deserve to be treated with kindness and that's what I try to give them. I've stopped killing bugs and feel bad whenever I see others do it so carelessly. They're just hanging out and doing their lives without trying to harm you. So why do we harm them?! I simply catch them and release them outside if possible. Yes, even spiders. I am slightly afraid of spiders still but do my best to catch them and release them out into nature so they can carry on with their days. It's a scary thing but I enjoy it and everyone's happy! Obviously these spiders are much better to have hanging around your house. Although I can bet that they won't be hanging around for long once you make them because they are so dang good. Happy spider making, friends! Blend together dates, cacao powder, almond butter, and water until smooth. Roll into medium sized balls and set aside. Melt a bit of the chocolate bar and use a piping bag to create 16-20 spider legs on parchment paper. Place legs in refrigerator to set up for 30 minutes. Remove from refrigerator and place four legs on each truffle ball. (Two legs on each side.) Use shredded coconut to make a mouth and eyes. Serve, enjoy!